The breadcrumb elements facilitate navigation between the application pages. With a single click, you can go back directly to the high-level table of contents or the specific data set to choose alternative tables in the same group. Some tables can show data for different measures. These buttons allow to quickly switch between the available ones. Four options are available. The "Share..." button will open a menu that allows to share the link to the current page on Twitter, Linkedin, via eMail, or copy it to the Clipboard. The "Structure" link will show a page presenting the coding structure of the current data table. The "Download..." button will open a menu to start a download of the current table as a PDF document or of a CSV file with all the data behind the current data table. The "Help" link opens this page. Use the "<" and ">" links to change the current period to the previous or the next one. The ">|" link takes to the latest period available. These numeric links will expand/collapse the table's rows up to the chosen level. See the next point for how to work at a local level. When clicked, a "right", or "down", arrow will expand/collapse all the following table's rows with a higher level. 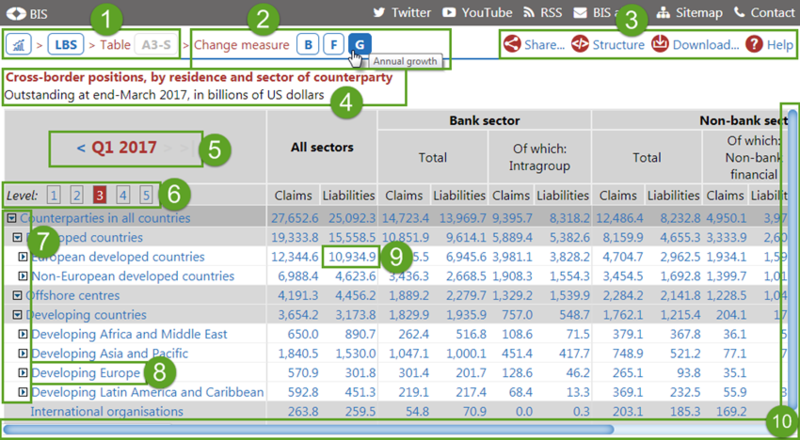 In some summary tables, where data for a number of countries are organised by rows, the country name in the first column is a direct link to a country-specific table, with more detailed data. All values in the tables are linked to the time series/expressions underlying the table's cell (see also the "Structure" tool). Clicking the link, the corresponding time-series page will open. Scrollbars signal the presence of more rows and / or columns. The headers are fixed.